Dwarf Mine is a top online slot from the house of Yggdrasil Gaming limited. This slot is of 5 reels and a huge 1,024-16,807 Payline game which offers jackpots of 100 times of your stake. Coin sizes for the game are 20 and coin range could be 10 per spin to up to £€125 per spin. There are 3 Bonus rounds available in Dwarf Mine slot machine. The one is Free spin feature gives you 5 to 10 free spins along with 3x multiplier. Dwarf Mine slot is a very adventurous slot game playable across all devices including mobile and smart phones. Play this slot using any Yggdrasil online casino real money. This slot is adventurous because your duty is to reveal hidden treasure deep in the mines with the help of Expanding Reels along with up to 1,024 ways to win. There are 2 free spin features in the game. The first one is Free Spins feature which gives you 10 free spins and the other is the collection Free spins feature which gets you 5 free spins. As the name suggests, Dwarf Mine slot is all about mining and searching hidden treasures inside mines. You will see some low paying symbols such as clubs, hearts, spades and diamonds on the reels of the game as well as some high paying symbols such as shovels, axes, helmets and lanterns. Landing same symbols on 3 consecutive reels from the left will get you a win. The multiplier will be added if you land on winning combination which includes more than 1 symbol on reel. Expanding Reels feature- This feature is triggered when you land the Bonus symbol on reels 1, 3 and 5 as this will expand to the whole reel (up to 3 reels) and will increase your ways to win up by 16,807. Free Spins feature- landing 3 bonus symbols on reels 1, 3 and 5 will activate this feature and you would receive 10 free spins on a 5×7 reel set. Collection Free Spins feature- If you collect 5 of the same colour symbols during base game then this feature is triggered and 5 free spins will be awarded to you. 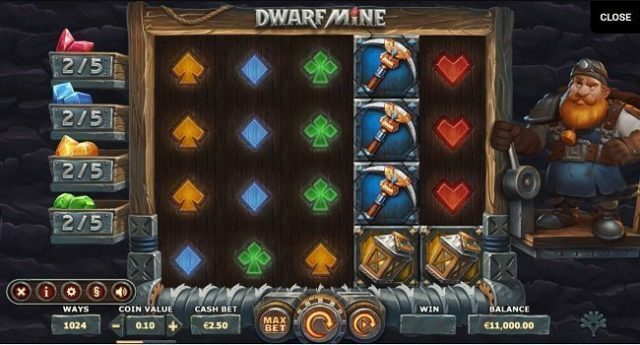 Dwarf Mine is a very nicely designed slot game that could get you a whooping 3,904.2 times on your total stake.